Try it in our fast, kid-friendly recipe. If my 5-year-old ruled the world, he’d eat vegan mac and cheese every day. We compromise at once a week. He doesn’t know it, but we’re living in a golden age for plant-based mac and cheese, where the once fringe riff on the dairy-based dish is poised to take a leap into the mainstream. I see the signs everywhere. ALSO KNOWN AS “NOOCH,” nutritional yeast is a seasoning that is often used in plant-based cooking. It has a tangy, cheesy taste, which comes from the single-celled yeast Saccharomyces cerevisiae. Nutritional yeast is loaded with B vitamins (including B12) and protein. It is especially popular in vegan mac and cheese recipes and as a popcorn topping. Look for it at the store near the spice section, in the bulk food section and online. In February, the 2018 World Vegan Mac ‘n Cheese Championship went down in Baltimore for the third year with thousands in attendance. Vegan soul restaurant The Land of Kush took first place from a field of 27 entrants with its baked mac and cheese. Here in Portland, vegan mac and cheese can be found on menus that cater to millennials, including Local Sprouts Cooperative and Silly’s (where it’s called the Vegan Strikes Mac). Health food stores and better-stocked supermarkets across Maine sell vegan mac and cheese as a mix in the pasta aisle and as a frozen meal. The ingredients in these recipes range from cauliflower and butternut squash to cashews and cultured vegan cheese. Nutritional yeast (called “nooch” by vegan insiders) is a common thread. For example, chef Christy Morgan uses butternut squash, tofu, tahini and nutritional yeast to create a vegan mac and cheese in her 2011 cookbook “Blissful Bites.” And cookbook author John Schlimm’s 2013 “The Cheesy Vegan” devotes a whole chapter to mac and cheese recipes, all of which use blends of cultured vegan cheeses, either made at home with Schlimm’s recipes or store-bought. 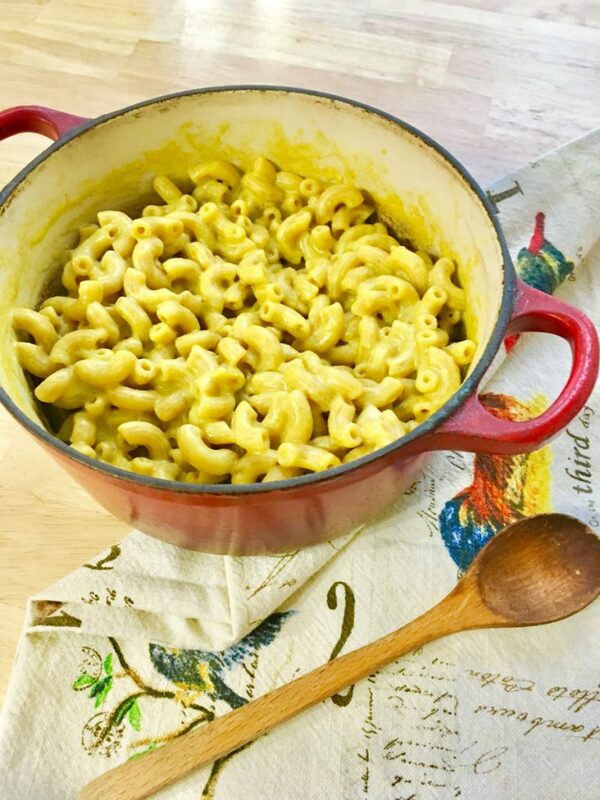 In Jennifer and Nathan Winograd’s 2011 “All American Vegan” cookbook, the mac and cheese recipe blends store-bought margarine, cream, cream cheese and cheddar cheese – all vegan versions – to form the sauce. Tofu is the heart of the vegan mac and cheese recipe in the 2007 classic “Veganomicon,” while the recipe in America’s Test Kitchen’s vegan cookbook, released last year, blends nutritional yeast, tomato paste, cauliflower and cashews. Miyoko Schinner, the mastermind behind vegan cheese brand Miyoko’s Kitchen, shared a recipe for mac and cheese dry mix in her 2015 “The Homemade Vegan Pantry.” To make it, she pulverizes cashews, nutritional yeast, oat flour and spices in a food processor. This dry mix can be stored in the pantry, then combined at mealtime with water or plant-based milk to make a sauce. I’ve tried and enjoyed many of these recipes, but as a group, their one drawback is the time it takes to prepare them. With a hungry 5-year-old at my side, I needed a recipe I could whip up for lunch. So, I created my own vegan mac and cheese dry mix that is as quick to make as the grocery store box variety and produces a creamy and flavorful (but not too flavorful) sauce designed for young tastebuds. I use nutritional yeast and spices for flavor and a mixture of soy milk (which is high in protein) and flour to create a creamy texture. I hope you enjoy it as much as my son does. Be sure to use plain soy milk, not vanilla flavored. COOK PASTA: Place 21/2 quarts of water and 1/2 tablespoon of salt in a medium-sized pot and bring to a rapid boil. Add pasta and cook according to package directions until al dente. Drain in a colander and set aside. MAKE DRY MIX: Combine the dry ingredients mix and set aside. MAKE SAUCE: After draining the pasta, return the pot to the stove over medium-low heat and pour in the soy milk. Slowly, add the sauce mix ingredients and whisk constantly for 3 to 4 minutes until the sauce thickens slightly. Stir in the cooked pasta, turn off the heat and mix the sauce and pasta together with a large spoon until the pasta is covered in sauce. The sauce will continue to thicken as you combine it with the pasta. Serve hot.